The rest of the leftover sushi, consisting of: 1 pc salmon nigiri (60 calories), 2 pc dragon roll (160 calories), 1 pc shrimp tempura futomaki (100 calories). I was studying for an exam today right up until I had to go to class, so 15 minutes before class I started running around in my room trying to get ready. It was quite a circus. I was taking a bite of sushi, running to put on clothes, another bite of sushi, washing my face, another bite and packing my bags, like that. Crazy crazy rushing. The sushi rice tasted kind of funny today, like the vinegar had soaked into it or something, making it taste sour. Plus the rice was a lot firmer, so just a lot less pleasant all around. 1 Columbo Light blueberry flavored yogurt cup (120 calories). I was not entirely starving because I had the sushi earlier, but I was going to do some volunteering in the afternoon so I wanted to make sure I had something to eat before then. The only options were a) more sushi (no thanks), b) pizza, c) mealoaf entree (too much food for a mid-lunch), or d) gross-looking soups. 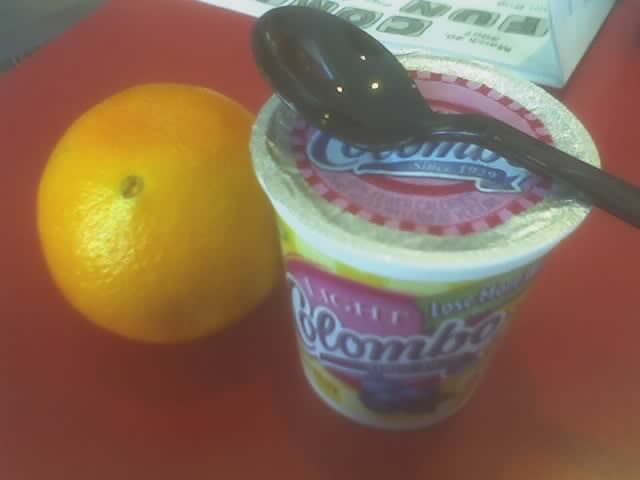 So I ended up getting the yogurt and an orange. I haven't eaten the orange yet though, I'll eat it later tonight hopefully. The yogurt filled me up pretty well, so I didn't need it. Roasted lamb entree: 5 oz. roasted lamb (320 calories), 1.5 cups of cinnamon basmati rice (300 calories), and 1.5 cups of mixed vegetables (40 calories). 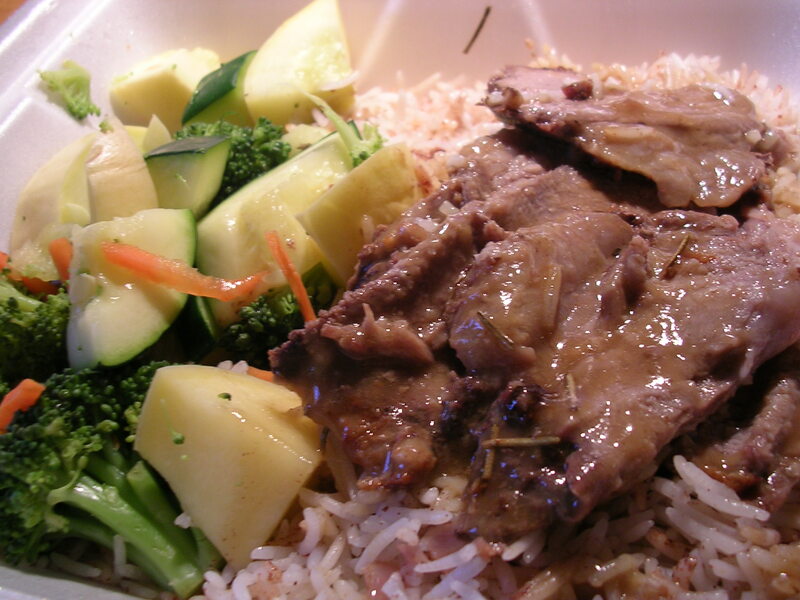 Mmm just what I needed after a long day… The lamb was tender without being too greasy, the rice was aromatic and slightly sweet from the cinnamon, and the vegetables helped lighten things up a little. I love the cinnamon basmati rice, it tastes lighter than regular rice, and I think cinnamon really makes it stand out as a side. Last 1/3 of imperial torte cake (~100 calories). 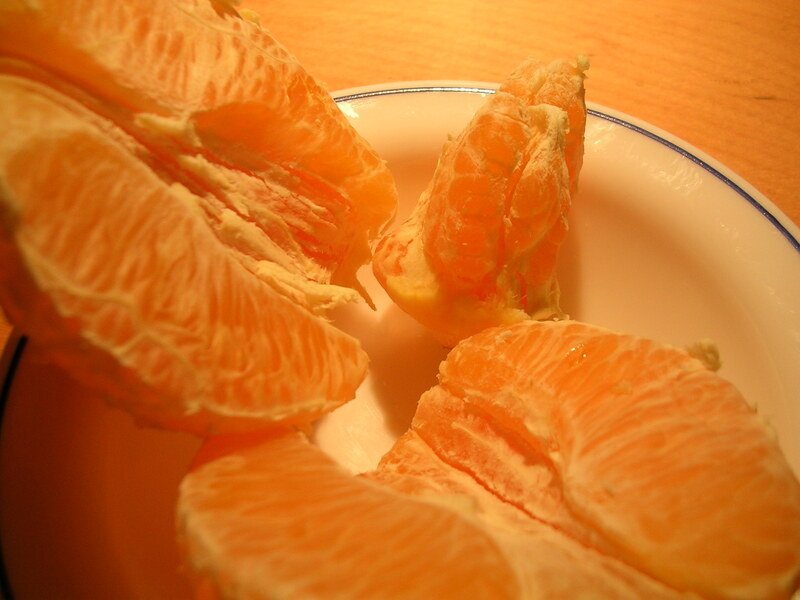 1 navel orange (70 calories). Have you ever noticed the weird "second" orange on the top of a navel orange? I never noticed until I came to college, but it just freaks me out. I don't understand how or why it forms, but it's almost like seeing a little orange fetus or something. I always eat it anyway haha, but I wish I could understand why it's there. So far 1270 for today. It's on the low side, so I might seek out more food later. This entry was posted on Thursday, March 22nd, 2007 at 12:18 am	and posted in American, desserts, fruit and nuts, Japanese, lamb, rice and pastas, snacks, Uncategorized. You can follow any responses to this entry through the RSS 2.0 feed.